During the last two years I have devoted many hours reviewing, organising and scanning the vast archive of Borderland Sciences Research Foundation (BSRF). The major part of this collection is now filed in alphabetical folders at AFU. Next in line of large-scale projects is the Parthenon archive. 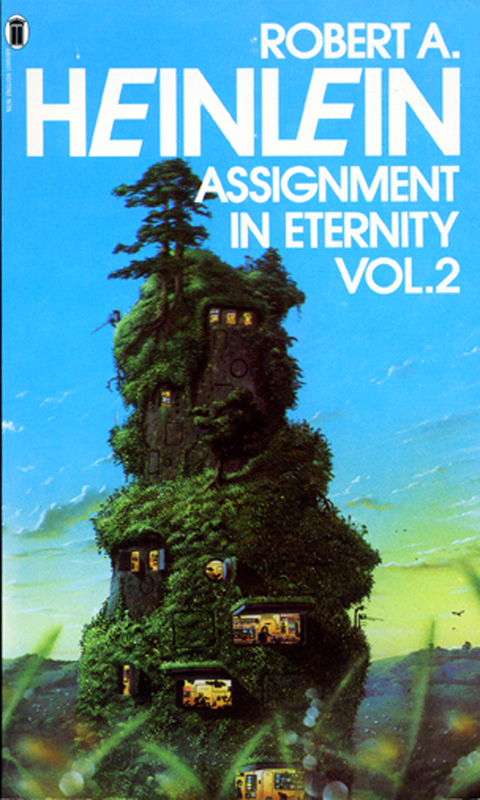 This unique collection was donated to AFU already in the 1980s but has unfortunately been somewhat neglected in favor of other projects. This archive is a treasure trove of hard to find information about organizations, personalities and debates during the first decades of the UFO movement, especially the contactee scene. What makes the Parthenon archive so internationally unique can to a large extent be attributed to the dedicated work of one remarkable woman, Edith Nicolaisen (1911-1986), founder of the Parthenon publishing house in 1957. She spent eight years studying at the universitities of Copenhagen, Paris, Berlin and Heidelberg. Her academic credentials are impressive: Modern languages such as English, German, French, Latin, Russian but also Philosophy, History, Science, Mathematics a.o. Fluent in several modern languages she worked as a translator, after the Second World War, for the United States Armed Forces in the European Theater and also in the Civil Censorship Division. 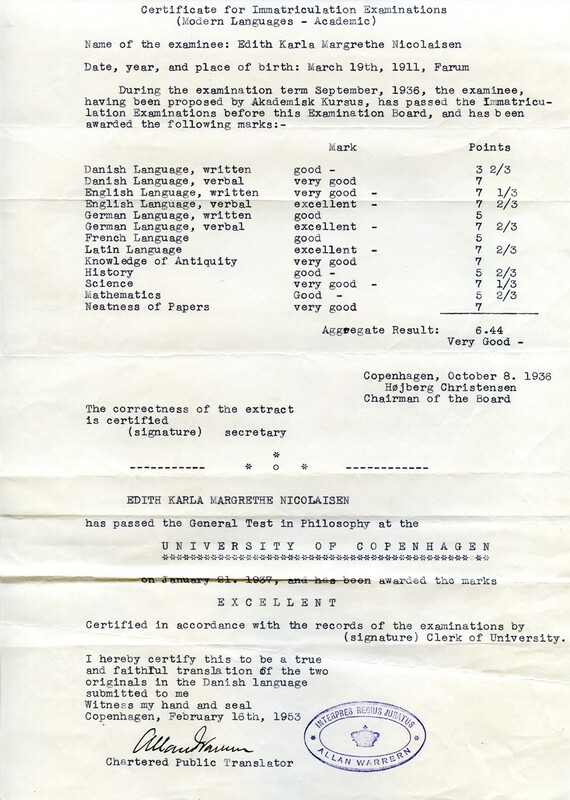 Always with excellent ratings in work and personal qualifications. Between 1953-1957 she worked as a saleswoman for the Swedish publishing company Diana Bildreportage AB, Hälsingborg. The prime heureka moment in the life of Edith Nicolaisen happened in 1954. 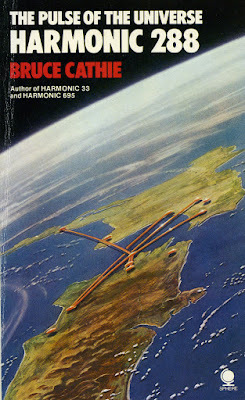 An event she described in a letter to contactee Basil van den Berg, South Africa, September 1, 1963: ” "The first book I read was that of Leslie-Adamski´s Flying Saucers Have Landed and something in me recognized the truth, however fantastic it all sounded to my intellect and narrow-minded teaching, we all have received. I am a Danish citizen, who in 1954 was faced with the difficult choice either to accept the doors suddenly flung open for an additional three years college-training in USA for a future career under WHO Geneve... or, to volunteer for the SAUCER-cause here in Sweden, which meant to chose the "thorny and stony" road of the lonesome pioneer. After a fierce fight between intellect and heart, the latter gained supremacy." 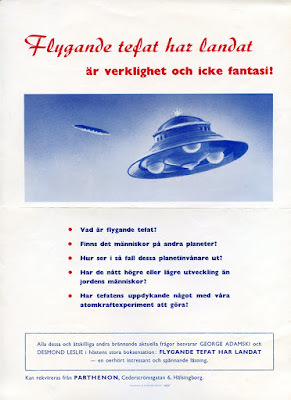 As a long-time student of the Esoteric Tradition Edith Nicolaisen became convinced of the deep spiritual and cultural significance of the coming of the flying saucer phenomenon and the messages presented by contactees such as George Adamski, Daniel Fry, Orfeo Angelucci etc. Between 1959-1969 she corresponded with BSRF director Riley Crabb. 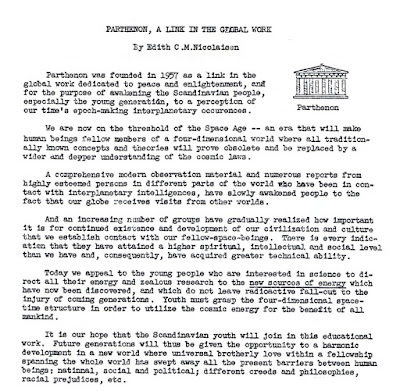 In an article published in Round Robin 1960 she detailed her vision of Parthenon. 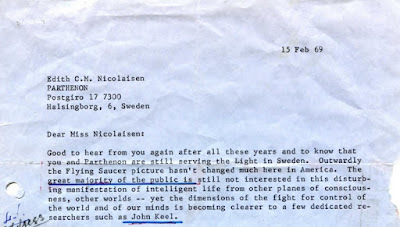 In a letter 1969 Riley Crabb gave Edith Nicolaisen credit as a server of the Light in Sweden. 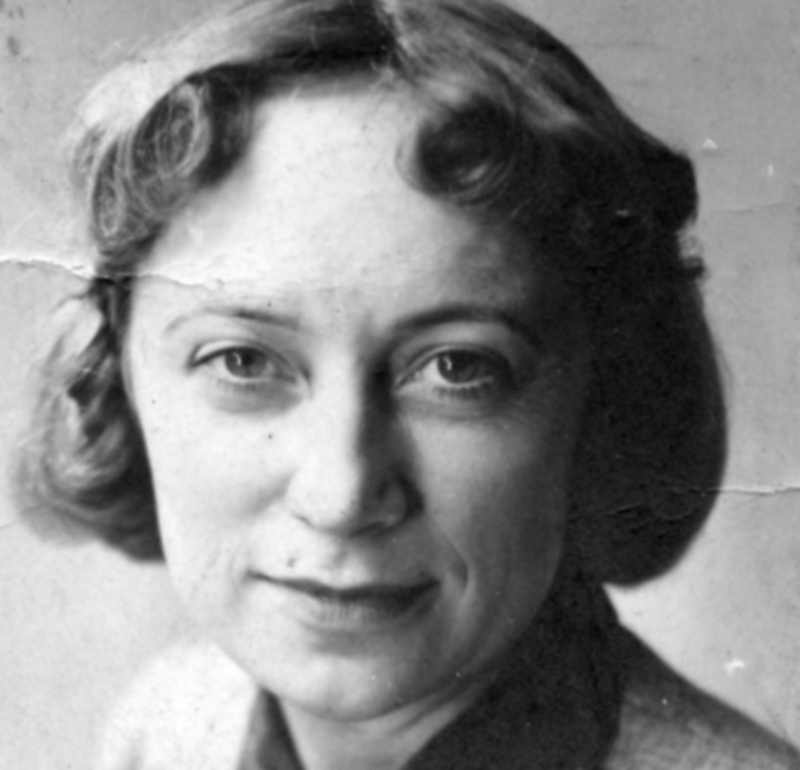 Edith Nicolaisen corresponded with almost all the known first generation UFO contactees and many ufologists active between 1950-1980. To my knowledge there is no correspondence archive in the world comparable in this respect. 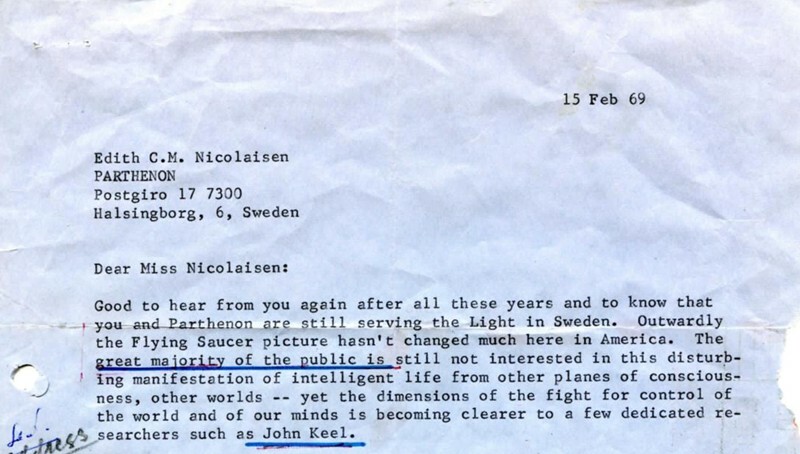 Although most letters are from individuals involved in the UFO contactee movement, there is a surprisingly large amount of correspondence from individuals like John Keel, Jacques Vallee, Ingo Swann and many others. There is a fascinating early letter from John Keel, January 28, 1970, where he laments the hostility he has encountered from the mainstream, scientific ufologists, who do not understand his research. As Edith Nicolaisen corresponded with many UFO contactees, not simply of personal interest, but in order to publish their books, she often became close friends with the contactees and the letters reveal details of UFO sightings, contacts and what happened behind the scenes in the UFO movement. 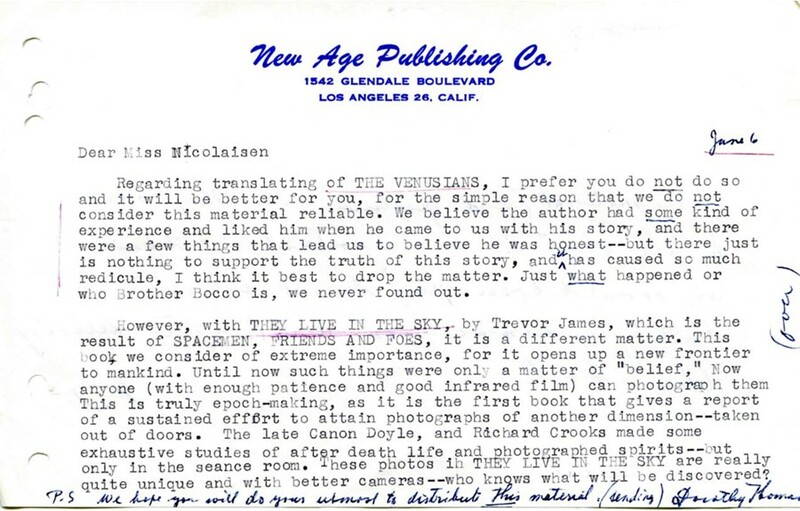 One of the foremost publishers of contactee literature in the 1950s was the New Age Publishing Company in Los Angeles, directed by Franklin and Dorothy Thomas. 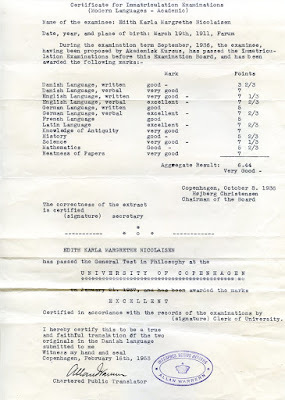 Employed in this company was also a man from Sweden, Mr. Carl E. Hallgren. In the Parthenon archive I have found 46 letters written between 1957-1960, correspondence with both Dorothy Thomas and Carl Hallgren. These letters are fascinating reading, giving insights into the discussions of which contactees should be regarded as genuine and reliable. 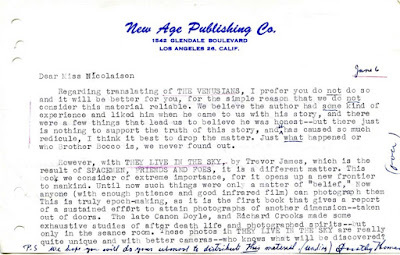 Notice in this letter the comments on contactee Lee Crandall, author of the Venusians and Trevor James (Constable), author of They Live in the Sky. Exept thousands of letters the Parthenon archive includes books, unpublished manuscripts, magazines, photographs and organizational files. In coming blog posts I hope to present unknown and interesting data found in the Parthenon correspondence collection. Two individuals have had a seminal influence on the development of the UFO movement in Sweden, Edith Nicolaisen and Gösta Rehn. Miles apart in their ideas and writings they were active during the same era, from the 1950s to the 1970s. Edith Nicolaisen, founder of the Parthenon publishing house, representing the New Age contactee movement and Gösta Rehn the scientific ufologist approach. Both of them developed far-reaching international contacts and consequently the correpondence archives of Nicolaisen and Rehn are very extensive with thousands of letters. A treasure trove of unique data accessible to academic scholars as well as researchers of UFO and paranormal phenomena. In Sweden we are in the unique position in having been able to salvage these voluminous archives from being dumped in containers. After months of negotiations in 1985-86 Mats Nilsson and Carl-Anton Mattsson from UFO-Sweden were able to acquire the entire Parthenon archive as a donation to UFO-Sweden and AFU. And in 1989 my AFU colleague Anders Liljegren and I succeeded in salvaging 32 binders with the Rehn correspondence, already dumped in a container. These correspondence archives are especially valuable as here we find data not aviable in published books, magazines and articles. The correspondence between Edith Nicolaisen and George Adamski is interesting in this respect, giving insights into the events, views and controversies of the contactee movement. The correspondence file contain 71 letters, written between 1954-1965. 25 letters are from George Adamski. 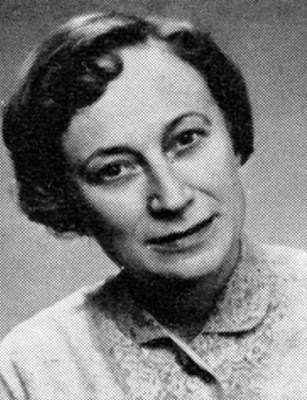 Edith Nicolaisen (1911-1986) published several of the UFO contactee classics of the 1950s and she corresponded with almost all known contactees and their co-workers. Among Adamski co-workers I have found letters from Desmond Leslie, Alice Wells, Lucy McGinnis, Carol Honey, Sonja Lyubicin, Lou Zinssstag, Madeleine Rodeffer, Alice Pomeroy, Adrienne Munkeberg, Fred Steckling to name just a few. (Letter from George Adamski to Edith Nicolaisen January 25, 1955). ”From the very first time I heard about ”Flying Saucers” coming from other planets, I believed it quite possible - to-day I am convinced! Had , too, the luck to see a ”Flying Saucer" of the Venusian type hovering some hundred meters about my head here in Sweden and last year during my holidays in the Austrian mountains a huge mother ship passed at a distance of about 500 meters and at the same level majestic, soundless and with incredible speed! 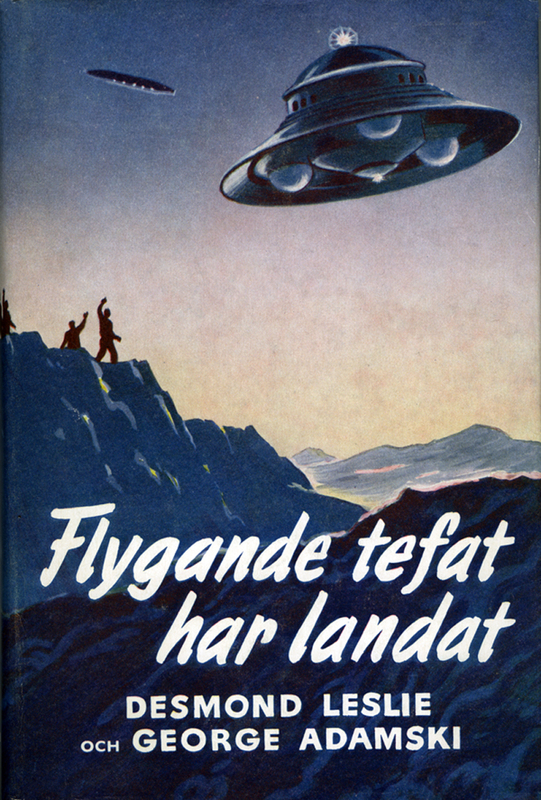 As it seems as if I belong to those ”elected ones", who always get the toughest jobs to solve in life, I felt it my duty to plant the banner of ”Flying Saucers” on the top of ”Mount Everest" here in Sweden. ”In November 1955 on a moonlit evening between 22-23 p.m. about 15 km south of Linköping while waiting in my car for a train to pass, I suddenly caught sight of a beautiful green-light far above the way-lin´s green signal-light. In order to see better I rolled down the car-pane on the left side and put out my head – and there a few hundred meters above the ground a big bell-shaped ”Flying Saucer” with portholes and landing gears was suspended in the air.. In the clear moonlight it looked like a magnificient silhouette of the world-famous Venusian-scout-design. From one side of the portholes shone a shaft of green light and from the other a shaft of orange light. (The colours and the intensity reminded much about our most beautiful neon-light advertisements.) As I had time to watch this ”silhouette” suspended in the air for 2 á 3 minutes before it disappeaed of sight, I noticed the details as above described. 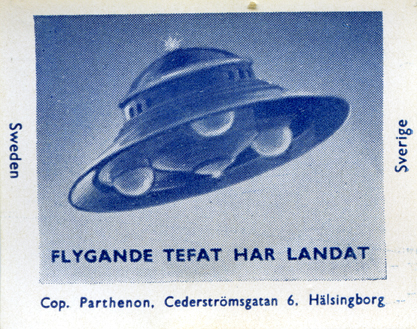 The next day a local newspaper reported that five people south of Linköping had observed a ”Flying Saucer”. 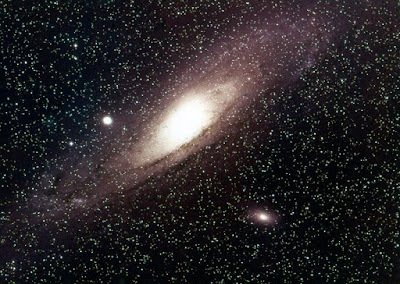 The description of the observers tallied with my own observation.” (Letter to Cosmic Brotherhood Association, March 1, 1962). 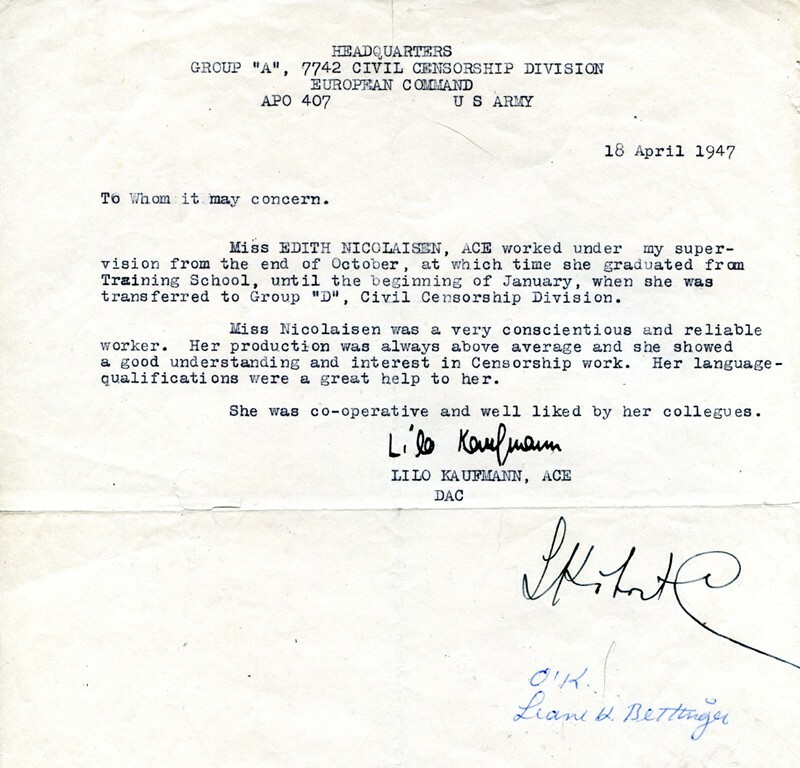 (Letter from Edith Nicolaisen to George Adamski, October 27, 1957). (Letter from Edith Nicolaisen to Frederick H. Curtiss, USA, September 19, 1959). 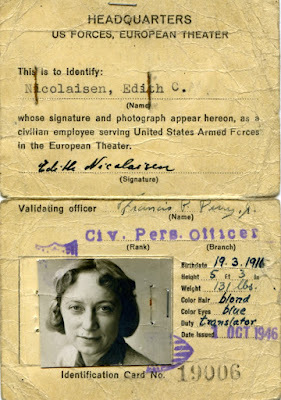 Edith Nicolaisen corresponded with Adamski co-worker Carol Honey 1962-1968. When the break between Adamski and Honey accurred in 1963 Edith suddenly found herself with double loyalities and vacillated between different views on who told the truth. She wanted to stay on friendly terms with both her correspondents but made some critical comments on Adamski to Carol Honey in a letter May 2, 1964: ” From past correspondence and G.A.´s strange behaviour during his world-lecture-trip in 1959 as well as during his lecture-trip in 63 during which he made many contradictory statements and let NEW-AGE-co-workers down by not keeping his appointments and promises and thus causing great embarassements – I knew at heart that G.A. 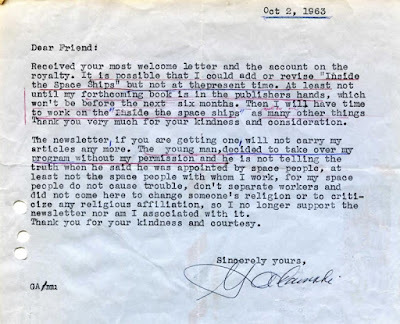 was not supported by the SPACE PEOPLE any longer… I agree entirely with your opinion that we must distinguish between the ”OLD Adamski”, who had his experience with the Space people as recorded in ”Fl.s.h.l.” and ”I. the.Sp.Sh.” and the ”NEW Adamski” who seems to be under some sort of psychic control from sources opposing the BROTHERS´ program. For some time it was a problem to me, but it is no longer after having been informed that G.A. started resorting to trance mediumship… we shall support you and your program, because we believe that you belong to the group, which we call genuine co-workers”. Actually Edith continued to support both Honey and Adamski. 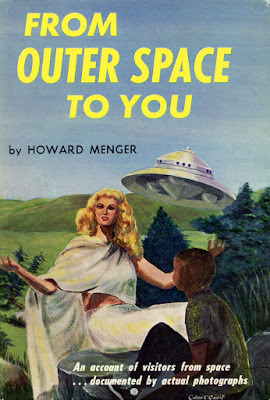 The spiritual message of the space people was for her the important issue. In 1963 she had written a ”A personal letter between two New-Age-co-workers”. 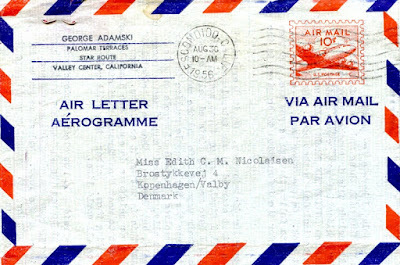 (Letter from Edith Nicolaisen to George Adamski, July 7, 1963). 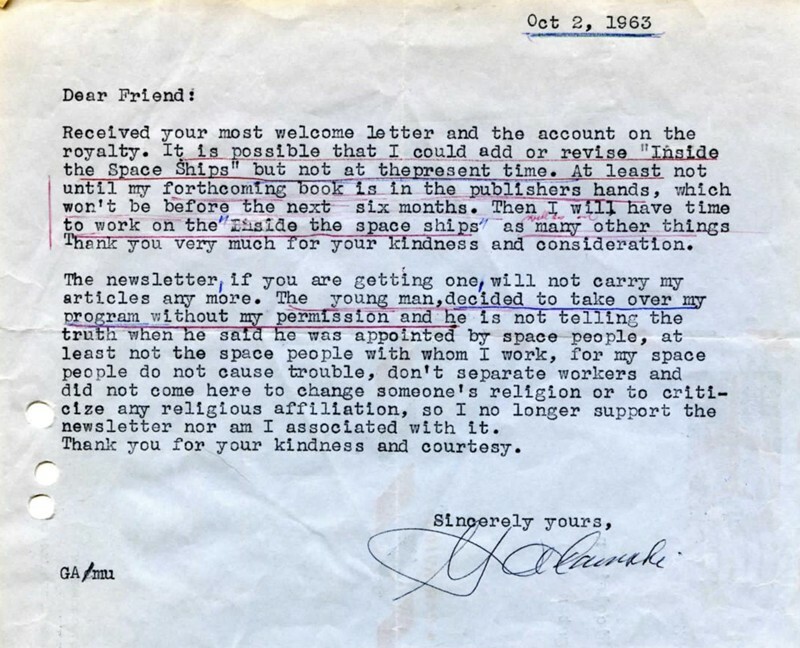 What is especially significant in this letter to Adamski is the total deprecation of Howard Menger and his contact experiences with space people. Especially since Edith Nicolaisen corresponded with Howard Menger between 1959-1966. 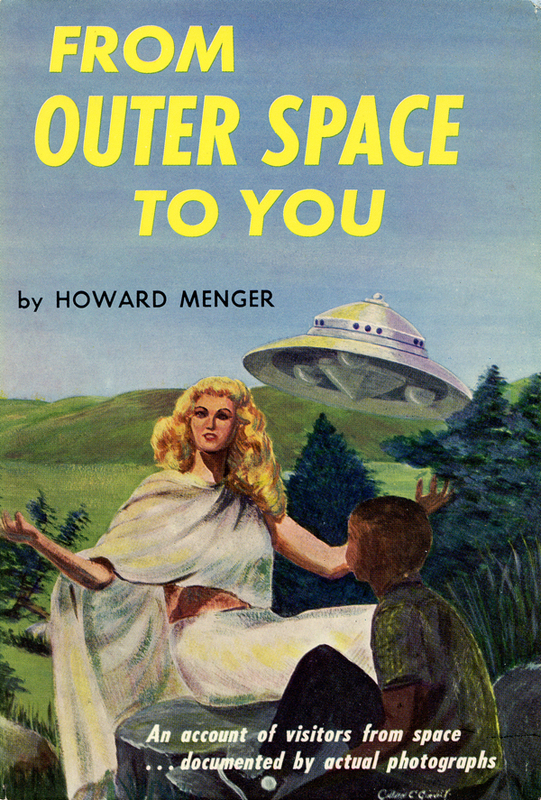 In her first letter to him she wrote: ”Having read your article in the Flying Saucer Review, London, I realize that you have been chosen by our interplanetary brothers and sisters to bring an important New-Age-message to the people on the Earth, therefore I would like to ask you, if I might get your permission to translate and to publish your book From Outer Space To You here in Sweden? 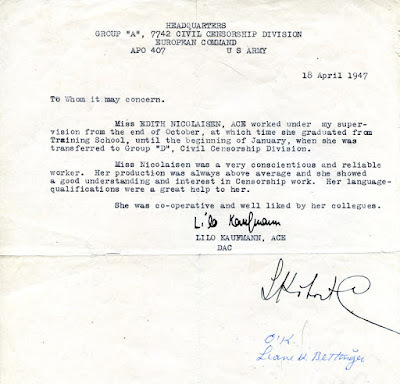 (Letter from Edith Nicolaisen to Howard Menger, February 10, 1959). In a reply Howard Menger gave Parthenon permission to translate his book but it was never published in Sweden. 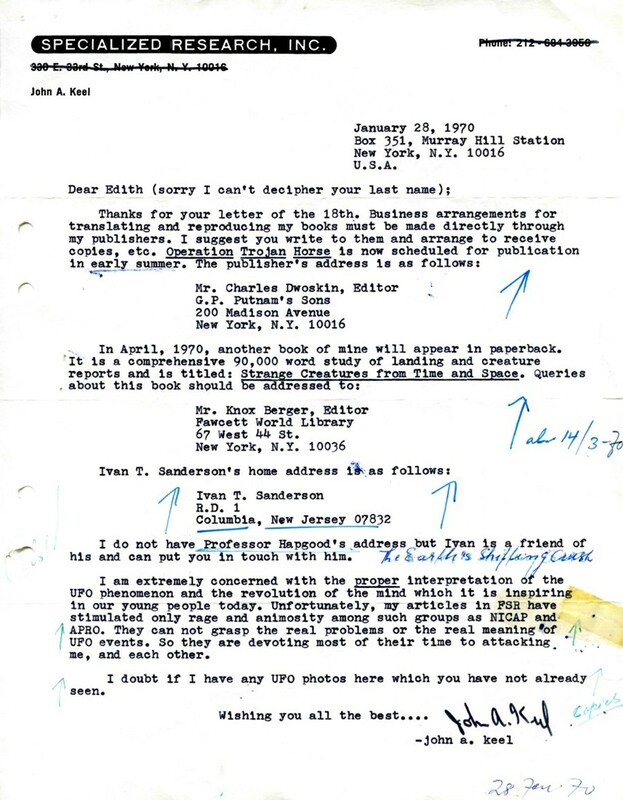 Maybe because in 1960 Edith received a letter from Ray Stanford who claimed that Howard Menger was a fake. Still she sold the English edition from Parthenon and in 1966 asked Menger for articles to a coming periodical. I find it something of an enigma that Edith Nicolaisen didn´t notice that From Outer Space To You was actually even more in line with the Esoteric Tradition than Adamski´s Inside the Space Ships. Howard Menger makes it very clear that his space people were not physical in the same sense as earth people and if we visited Venus we would not be able to see them. In his last letter to Edith Nicolaisen, February 29, 1964, George Adamski wrote: ”I know that people all over the world would like the latest information but it takes a lot of work to get it together and have it published and all involves time, which I have so little of… I deny myself many things to get the work out the best I know, knowledge that the Brothers have given to me. 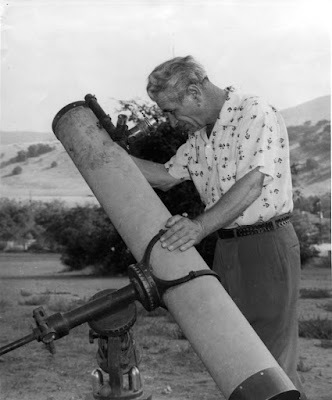 I just had a contact with them recently where they told me that much more deeper could be given but unless the present knowledge given is partially absorbed by applying it in our daily lives the other knowledge will have to wait.” George Adamski died on April 23,1965. 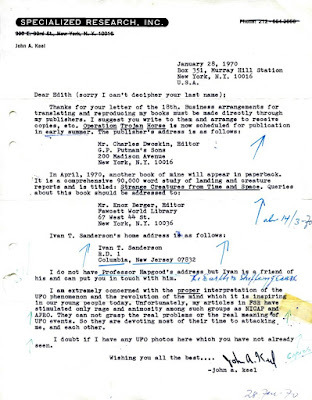 This correspondence is ample evidence of the importance of saving letters in UFO archives. Books, magazines and articles can usually be found again if lost but with correspondence the situation is different. We only have one copy. Once lost it is gone forever. In all types of research letters are an indispensable tool that may open doors to knowledge, impossible to discover in other sources. "I have an uneasy feeling that the world is being slowly and surreptitiously taken over by an all-powerful elite." These are the words of New Zealand airline pilot Bruce Cathie in the foreword to his book The Pulse of the Universe. 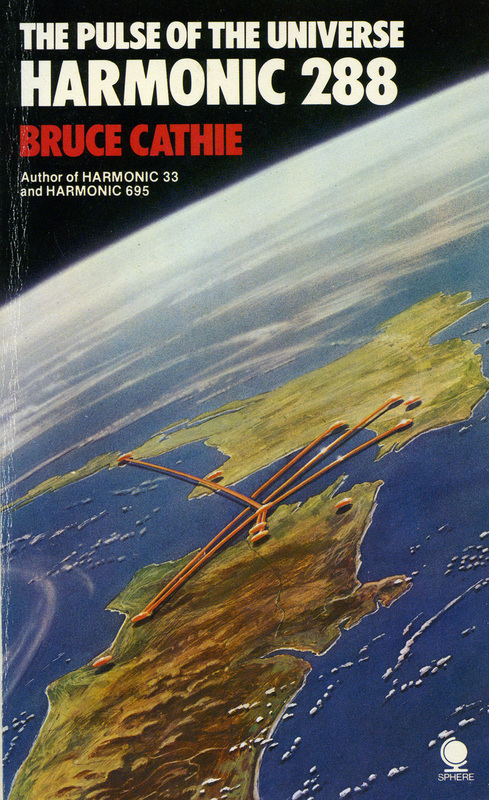 Harmonic 288, published in 1981. Mention conspiracies and almost everyone will associate to evil powers and groups. Today there are untold numbers of books, magazines and internet sites devoted to various dark conspiracies. As a somewhat heretic counterbalance I wish on this first day of the new year 2019 present a few sources giving a more hopeful and positive alternative – a benevolent conspiracy. This idea is not only found among the naive new age mystics and cultists but seriously discussed as a hypothesis in many of the works of Jacques Vallee and Allen Hynek. 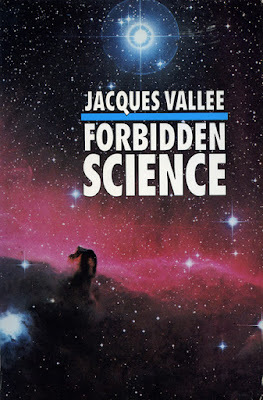 To understand their fascination with this controversial topic it is necessary to know that both Vallee and Hynek have one foot in science and one foot in the Esoteric Tradition. This is especially evident in the co-authored The Edge of Reality (1975) and Forbidden Science I-III by Jacques Vallee. In the first volume of his diaries, Forbidden Science. 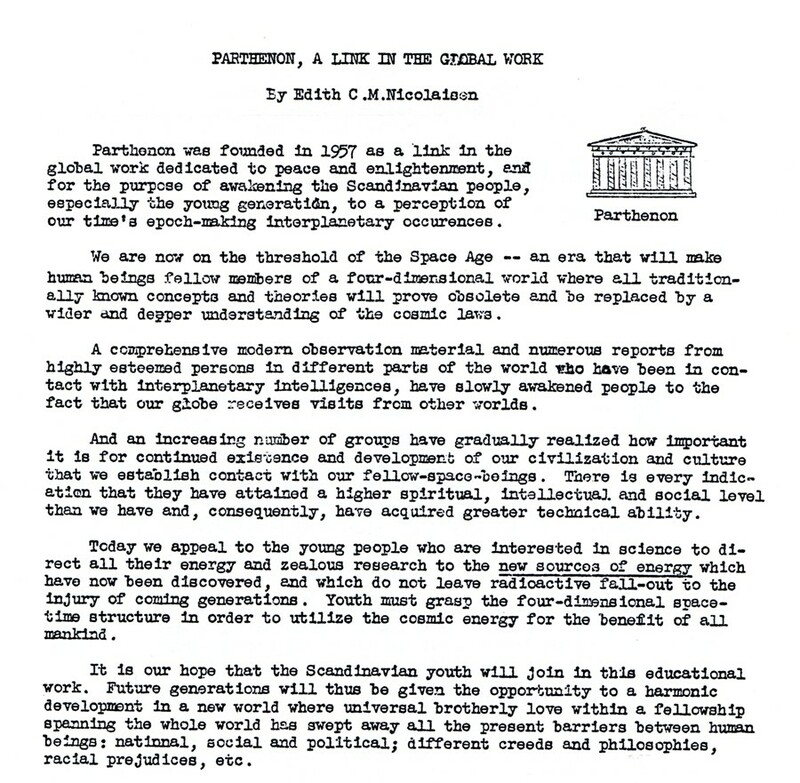 Journals 1957 - 1969, Vallee discuss the theory of a hidden group of individuals, planetary guardians, working behind the lines to further mankinds progress: ”Has the future spiritual state of man already been achieved by some individuals? Have certain gifted men already achieved contact, on some plane, with those who may be guiding our psychic evolution?” (p. 80). References to a hidden group of highly advanced individuals secretly guiding the evolution of man is found throughout history. Such a benevolent conspiracy is hinted at in Hermeticism, Alchemy, Kabbalism, Rosicrucianism and in many works of fiction. In his second novel Wilhelm Meister´s Apprenticeship the German author Goethe gives a vivid description of how The Society of the Tower become his secret mentors. But it was not until 1875 that the planetary guardians, the Higher Intelligence Agency (HIA) for the first time in modern history decided to reveal their existence and present fundamentals of the Science of the Multiverse, The Ancient Wisdom. The cultural impact of this ”disclosure” was profound and several scholars and academics began to realize that the Esoteric Tradition can be regarded as the third intellectual force or pillar in cultural history, alongside religion and science. 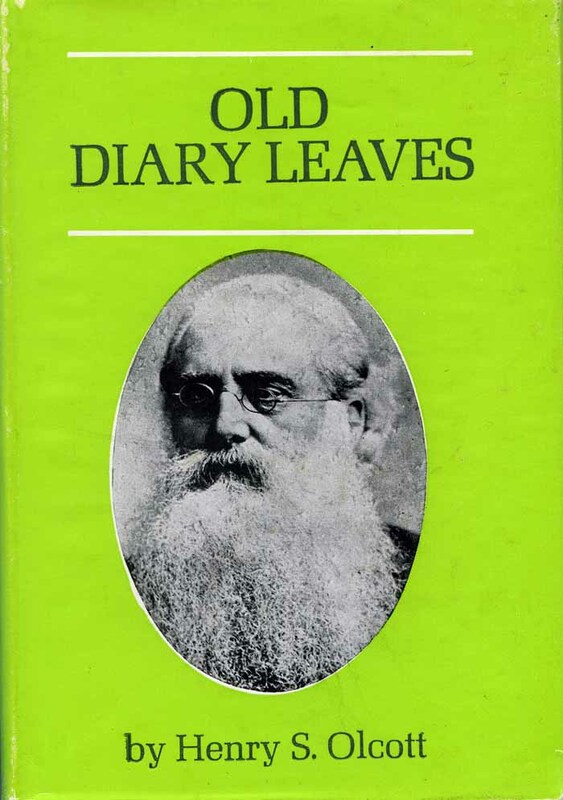 The woman chosen for this mission impossible was Helena Petrovna Blavatsky, who together with the lawyer, journalist and pioneer in psychical research Henry Steel Olcott founded the Theosophical Society in New York 1875. Blavatsky and Olcott had several meetings with and close cooperation with various representatives of the planetary guardians and came to understand that these individuals were no astral spooks but living men and women united in an ancient fraternity. In Old Diary Leaves Olcott narrates his experiences and doubts before he became head of the Theosophical Society. To his very sceptical friend Mr. A.O. Hume he tried to explain his decision in a letter September 30th, 1881: "... I would never have taken anybody´s evidence to so astounding a claim as the existence of the Brothers, but required personal experience before I would head the new movement... I got that proof in due time". 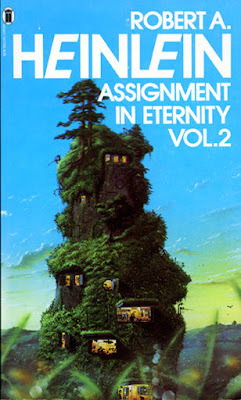 One of my favourite novels that reveal a deep understanding of esoteric philosophy and the complexities of the benevolent conspiracy is Lost Legacy by science fiction writer Robert Heinlein. 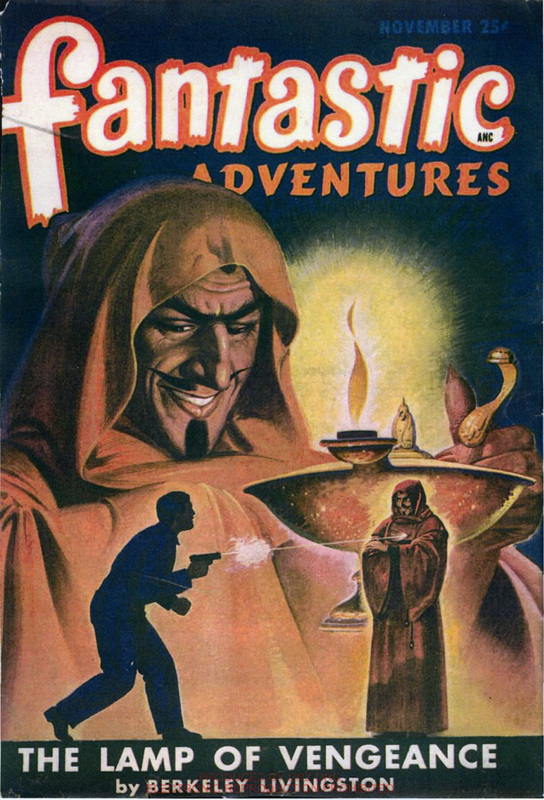 Published in the November 1941 issue of Super Science Stories it was later included in the collection Assignment In Eternity. Three scholars from California University, interested in paranormal phenomena, decides on a road trip to Mount Shasta. One in the group falls on a slippery cliff resulting in a fracture of the schin bone. A tall, elderly man appears from nowhere and offer his help. The group is led through a passageway into the mountain where they find themselves in a living room, illuminated by indirect lightning… They are then introduced to the around thirty persons resident in several rooms, men and women of different ages and nationalities. With the advent of the ”flying saucers” a new element was introduced in connection with esotericism and the benevolent conspiracy - ancient Vimanas, used by both the planetary guardians and extraterrestrial visitors. This connection was documented by authors such as Desmond Leslie, Meade Layne and Riley Crabb. 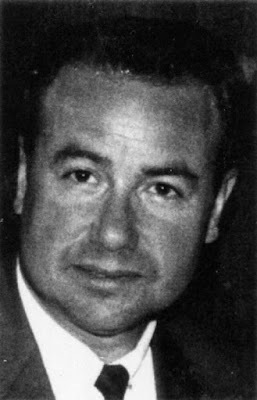 It was further explained by UFO contactees Millen Cooke, Paul M. Vest, Daniel Fry and Howard Menger. 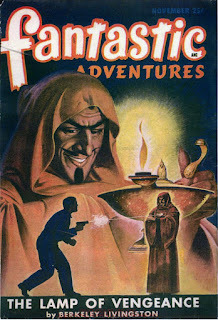 Millen Cooke´s article Son of the Sun, published in Ray Palmer´s magazine Fantastic Adventures, already in November 1947, is remarkably prophetic of what was to come regarding UFO contacts in the 1950s: "We are alrady here, among you. Some of us have always been here, with you, yet apart from, watching and occasionally guiding you whenever the opportunity arose... We have been confused with the gods of many world-religions, although we are not gods, but your own fellow creatures, as you will learn directly before many more years have passed... Some of you have seen our "advance guard" already. You have met us often in the streets of your cities and you have not noticed us. But when we flash through your skies in the ancient traditional vehicles you are amazed... These are our mechanical means of transport. Now that the art of manufacturing plastic materials has reached a certain perfection among you, perhaps you can imagine a material, almost transparent to the rays of ordinary visible light, yet strong enough to endure the stresses of extreme rapid flight." 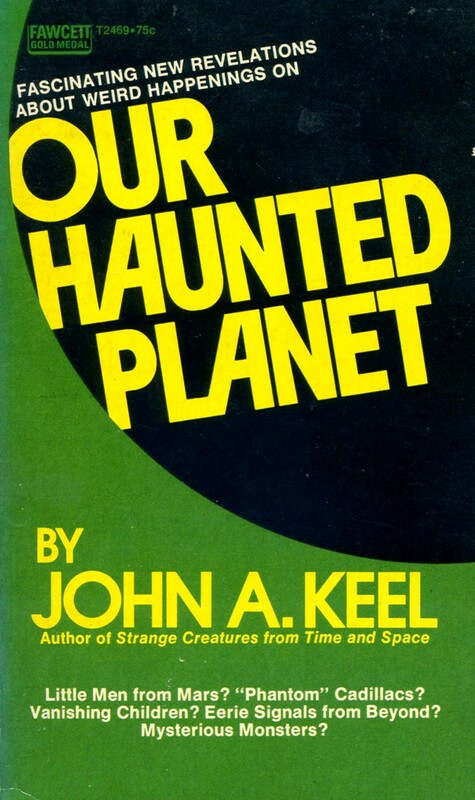 My favourite Fortean iconoclast, John Keel introduced the theme in Our Haunted Planet, commenting on H. G. Wells´prophetic novel Things To Come. In a world ravaged by war and misery a group of scientists and philosophers band together in an effort to restore civilization. They call their organization Wings Over the World (WOW): ”Much of the UFO evidence suggests that a real WOW has always existed. Maybe one of their members handed a caveman the first flaming brand and the first wheel, just as some unknown party alledgedly deposited the first compass outside that Mormon tent… The members of WOW are still watching as they have always done…” (pp. 18, 222). In many blog posts I have asserted that accepting, as a working hypothesis, the reality of a multiverse as presented in the Esoteric Tradition does not imply irrationalism or a loss of intellectual integrity. Like Hynek and Vallee I see no problem in having one foot in empirical science and one foot in esotericism. In Forbidden Science, vol I, Jacques Vallee expound his view on this problem: ”To me there is indeed a fundamental reality of hermetic science…Everyone must find his or her own expression of it. The spiritual path I have chosen is that of intelligence tempered by the fire of love, but always applied to accessible, solid, consistent, calibrated facts.” (p. 82). This is esoteric philosophy, an aspiration towards the good, the true, and the beautiful.